Exsultate, jubilate (Exult, rejoice), K. 165, is a 1773 motet by Wolfgang Amadeus Mozart. This religious solo motet was composed when Mozart was staying in Milan during the production of his opera Lucio Silla which was being performed there in the Teatro Regio Ducal. It was written for the castrato Venanzio Rauzzini, who had sung the part of the primo uomo Cecilio in Lucio Silla the previous year. 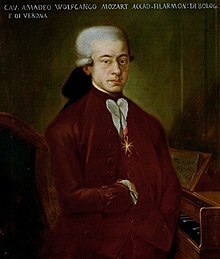 While waiting for the end of the run (from 26 December 1772 to 25 January 1773), Mozart composed the motet for his singer, whose technical excellence he admired. Its first performance took place at the Theatine Church on 17 January 1773, while Rauzzini was still singing in Mozart's opera at night. Mozart made some revisions around 1780. In modern times, the motet is usually sung by a female soprano. Although nominally for liturgical use, the motet has many features in common with Mozart's concert arias, such as those drawn from his operas. Mozart also used elements of concerto form in this motet. Written in Latin, the author of the text is unknown but may have been Rauzzini. let the heavens sing forth with me. frondes dextera plena et lilia date. give garlands and lilies with full right hand. ^ a b Richard Hamilton; Paul F. Zweifel. "The Three Versions of Mozart's Exsultate, jubilate". pzweifel.com. Archived from the original on 15 July 2011. Retrieved 27 February 2008. ^ Feldman, Martha (2007). Opera and sovereignty: transforming myths in eighteenth-century Italy. New York: University of Chicago Press. p. 56 n. 36. ISBN 978-0-226-24113-5.